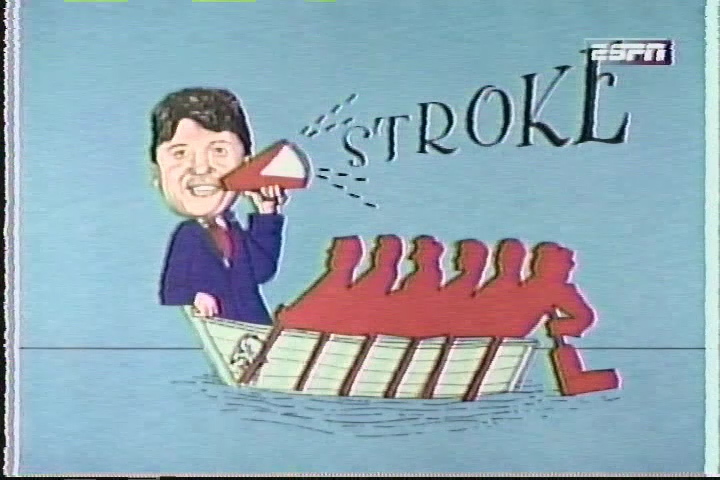 But the best were these comedy sketches that served as “bumpers” before and after commercial breaks. I dare the NHL to once again at least attempt something as funny as “The Wig Helmet.” Read on, and you’ll soon understand what I mean. Here is a rundown, with images and video clips, on why the 1997 NHL Awards Show was the best NHL Awards Show — ever! Just like Saturday Night Live, the show starts with a “cold open” before the credits. Here, Ron MacLean is explaining to Phil Esposito that he is no longer the fourth-all time goal scorer in NHL history. “You’re three behind Doug Houda…but hey, look, Phil…you’re still ahead of your brother Tony.” Twenty years later, I still laugh pretty hard at this. 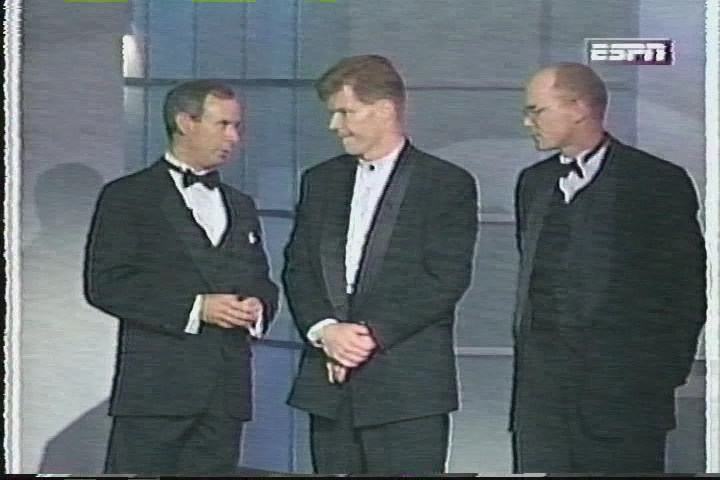 When the 1997 NHL Awards show went to commercial, or came back from one, they would lighten the mood with these funny comedy sketches. Keith Primeau wishes that he could play without the mandatory head protection so he can show off his hair. His brother Wayne offers a solution. Next up is a parody of that Nike hockey skate commercial where an out-of-work goalie is driving a taxi cab. Here, the goalie-turned-cabbie is played by Kelly Hrudey, who coincidentally went onto a successful career in front of the camera as a broadcaster. 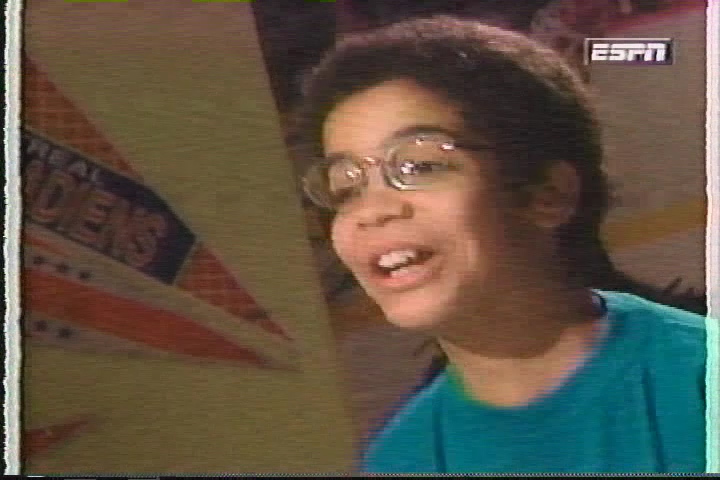 I put this video up on YouTube almost 10 years ago, but it has gotten a ton of views lately because it was pointed out that this comedy sketch stars a 10-year old Aubrey Drake Graham — a.k.a. 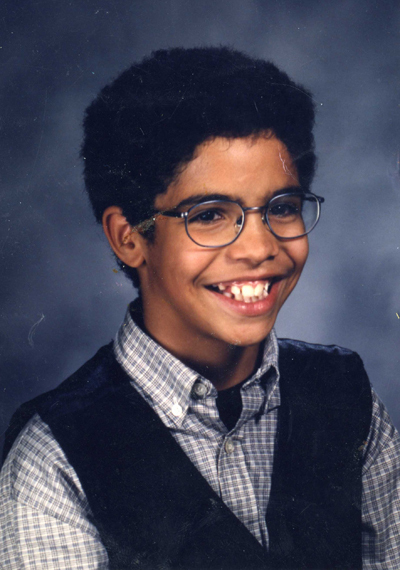 rap star Drake — four years before acting in Degrassi: The Next Generation and almost a decade before he became a singer. The hair, glasses and teeth are the same. It’s gotta be Drake. He was born in Toronto, and the 1997 NHL Awards took place in Toronto. Unfortunately, there are no end credits or any mention of the actors in the comedy sketches, but this hip hop blog says that it’s Drake, so that’s good enough for me. For lonely referees who have no calls to make during the game they are officiating, they can call and talk to each other. A quick lesson for the young folk: before the internet, “chat lines,” where people could call in and talk to strangers, were a somewhat-popular and very expensive way to pass the time, sometimes costing $3 per minute. That’s a lot in 1990’s dollars. The last comedy bit is probably the best, but also might need a little bit of explaining. Back in the late 1990s, Wayne Gretzky endorsed Campbell’s Soup, and appeared on some soup labels. This video hilariously expands on that idea. I got your Bourque and Beans RIGHT HERE!!! All awards shows list out the nominees and their merits, but the 1997 NHL Awards show got creative and used it as a way to include more humorous segments. For example, Toronto street cops — really just actors — tell us why the Lady Byng nominees are the good guys. Wouldn’t you rather ask the cops about the most-penalized players? 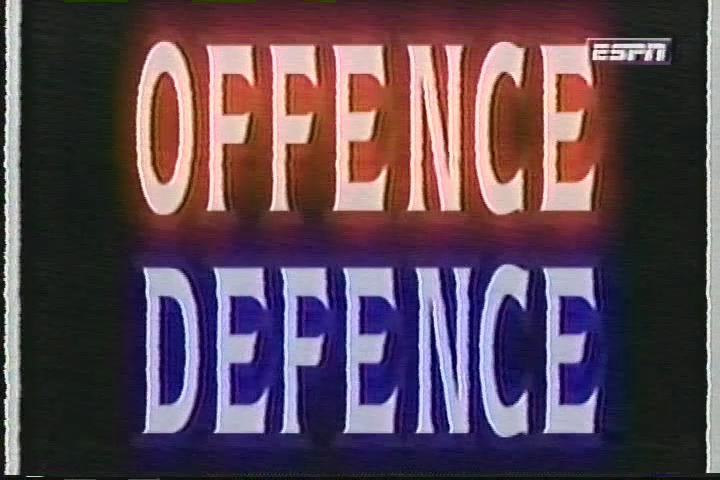 Later, the Selke nominees are presented like the opening of TV show Law & Order, complete with Chung! Chung! sound effect. Twenty years later, Fox and Farrell are still practicing law, while Ballantyne (above) is a lawyer by day and a musician by night. With all the police and lawyer references in the 1997 NHL Awards, its like the league was trying to play up its stereotypically-violent image. Nonetheless, that’s (allegedly) two people who appeared in this Awards show who went onto careers as musicians. The best nominee presentation was a janky animation for the Jack Adams Awards nominees (watch it here). 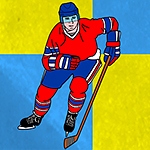 It’s not as good as those recent Stanley Cup Stories animations, but it still gets laughs. Actor D.B. 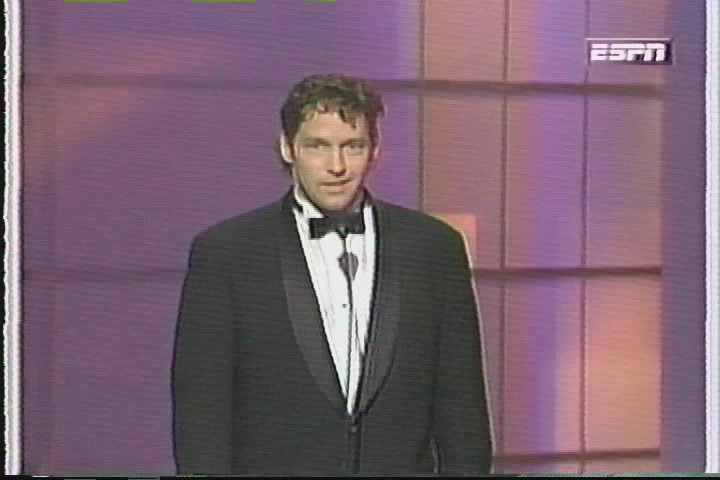 Sweeney at the 1997 NHL Awards Show. 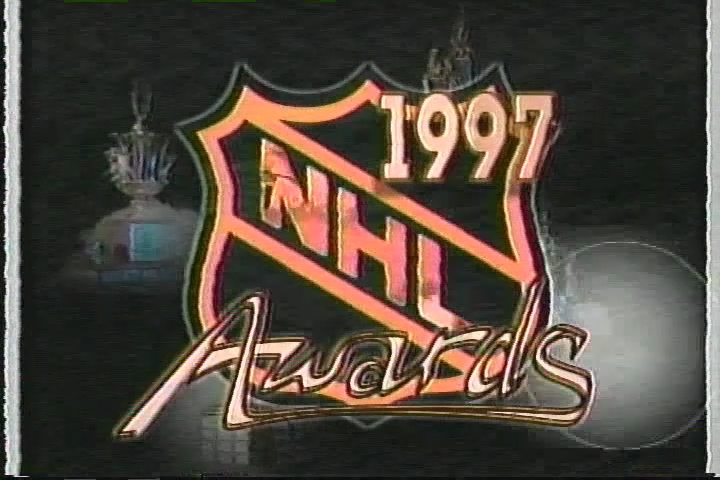 The presenters for the 1997 NHL Awards Show were Cameron Bancroft, Rachel Blanchard, Michael Burgess, Bob Cole, David James Elliott, Paul Henderson, Kirk Muller, Cam Neely, Tim Robbins, Kathleen Robinson, John Saunders, D.B. Sweeney and Bryan Trottier. I wouldn’t profess that I know all of those actors and actresses, but they were all more or less well-known back in 1997. The hockey people, though, are golden: Cole, Henderson, Muller, Neely, Saunders and Trottier. 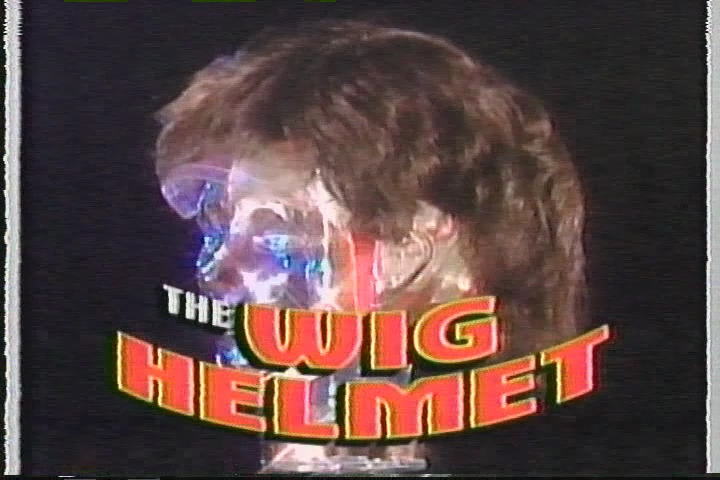 Heck, we could count Sweeney as a hockey person too, since he starred in The Cutting Edge. Of course, there is some cheesy humor. Paul Henderson jokingly takes credit for his goal at the 1972 Summit Series as causing the Soviet Union to fall. Former Beverly Hills 90210 star Cameron Bancroft spastically jerks his head around, telling co-presenter (and fomer 90210 colleague) Kathleen Robinson that he’s practicing his moves to be a goalie. Clueless star Rachel Blanchard enthusiastically informs the crowd that the Lady Byng goes to “the Canadian Women’s Hockey Team for winning the World Championships! You guys rock!” Three painful seconds later, the audience laughs at her joke before Blanchard states that Paul Karyiya actually won. Still, neither of these comic miscues are nearly as bad as the Zemgus Girgensons/Caitlyn Jenner joke from the 2015 NHL Awards show. Mario Lemieux retired for the first time at the close of the 1996-97 season. Since he was one of the greatest hockey players of all-time, the NHL featured a nice video tribute to Le Magnifique. Larry Murphy (center) and Bob Rouse (right) give Ron MacLean (left) an update on the condition of Vladimir Konstantinov and Sergei Mnatsakanov, who were seriously injured in a car accident. 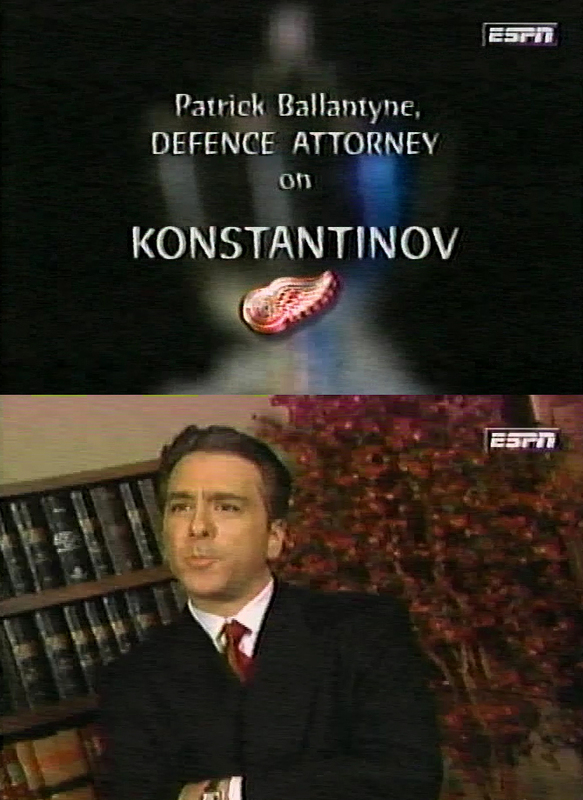 Throughout the show, everyone expressed their concern for Detroit Red Wings defenseman Vladimir Konstantinov and team masseur Sergei Mnatsakanov. Both were seriously injured in a limousine crash after the Red Wings won the 1997 Stanley Cup Championship. Twenty years later, sadly, both men are still crippled from the accident. It was touching to see so many players give their well-wishes for the two during the awards, which shows how tightly-knit a community hockey is. Tomorrow’s show will be my first NHL awards show, I’m looking forward to it. It finally all came together this season where I was able to become a fan so I’m way, way behind. Man this gave me a flood of great memories watching this as a kid. Ron is simply perfect for the role of host. Super nice guy, as serious as a slice of toast, but as you said, has a huge sense of humour. I can’t say that the shows have been the same since the mid 00’s. Trying too hard. Or trying to appeal to the general US market is probably more like it (hence the move to Vegas a few years ago). One of those things that makes me appreciate the 80’s/90’s NHL more. Frankly, all of the 90’s award shows were decent. The 96 opening was classic – “don’t worry Mr. McLean, we won’t let any rats hurt you”, the 95 show with the “Arnott” skit comes up in our house now and then to this day and the 95 skit involving Royal Canadian Air Farce’s “Stumpy Tom Conway” is one of my all time favourite moments. Unfortunately none of these awards shows are online. Might have to dig out my VHS and see if I still have one or two taped!